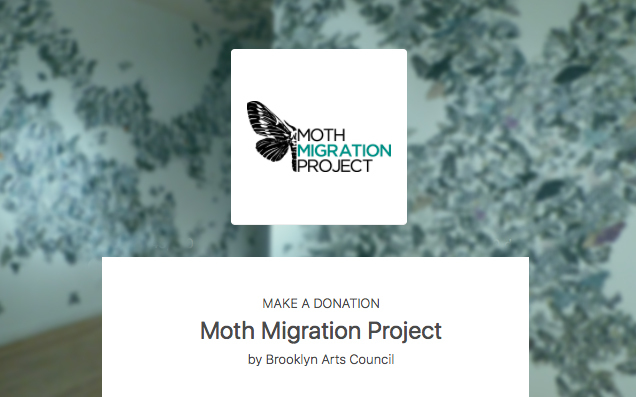 I have tremendous news, the Moth Migration Project is now a fiscally sponsored project of the Brooklyn Arts Council! The first 10 people to donate $250 or more will received an 8″ x 10″ signed and numbered drypoint moth etching! The first 25 people to donate $100 or more will receive an 8″ x 10″ signed and dated linoleum block moth print. The first 100 people to donate $50 will receive a commemorative MMP postcard. This remarkable news means that your financial contribution is a tax-deductible charitable donation that goes directly to support this project. Tax-deductible donations will have an enormous impact on MMP’s future. Administered by the Brooklyn Arts Council, just click here and go to Give Lively to donate. The Moth Migration Project spans all cultures, ages, countries. It is a tool for community building in both physical and digital worlds. The Moth Migration Project is about the spirit of belonging, and it encourages personal creativity and human connection. I am inviting you to be a part of that relationship. Offer free community moth printmaking workshops worldwide specifically aimed at the underserved from young children to older adults. Hire “Moth Ambassadors” to create community in their local areas. Launch the expanded MMP website to show off every artists moths, and make it searchable! Develop grade appropriate curriculum for learning communities in the environmental sciences and arts. Build a physical archive to preserve the moths so curators may use to create additional traveling exhibitions. To date, I received incredible support from Speedball Art, Inc. who generously donated ink, rollers, and papers for printmaking workshops. Susan Martin, Founding Directors of Some Serious Business, gave beautifully written public relations and marketing support for the first exhibition of the Moth Migration Project. I received tremendous support from friends who counted, stamped, cataloged and installed the moths. I could have never done this first year without their big-hearted help. Now, I am asking for your financial support to launch the next phase of this vital project. Just click here and go to Give Lively to donate. Your donations will further my work in building the physical and digital community spirit that fosters genuine connections and engages public participation representative of the Moth Migration Project. Help me to create shared experiences that embrace and celebrate mutual respect for personal uniqueness, creativity and the nature around us. Financial contribution is not required in any way to join the MMP. If you, your family, your community or school want to join the project and become part of an international movement, just click the “join” link and follow the directions.